Dice the bacon and cook it well in a frying pan. Drain grease, reserving about a tablespoon. 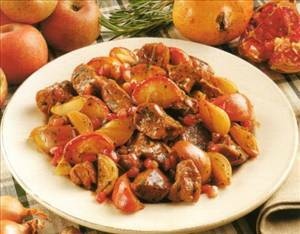 Brown beef stew meat in same pan. Put all ingredients into a crockpot for 8 hours. Note: it's ready when the beef is extremely tender like an osso bucco. There are 357 calories in 1 serving of Beef Stew. Calorie split: 44% fat, 5% carbs, 51% protein.